A family finds home in a traditional ranch’s modern makeover. 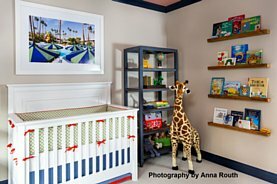 As with any growing family, Allison and Bucky Westmoreland found their need for increasing square footage was directly correlated to the number of children they had. However, the traditional ranch-style home they purchased in Sunset Hills was anything but the expansive and functional space they needed. The home was in dire need of a complete overhaul. 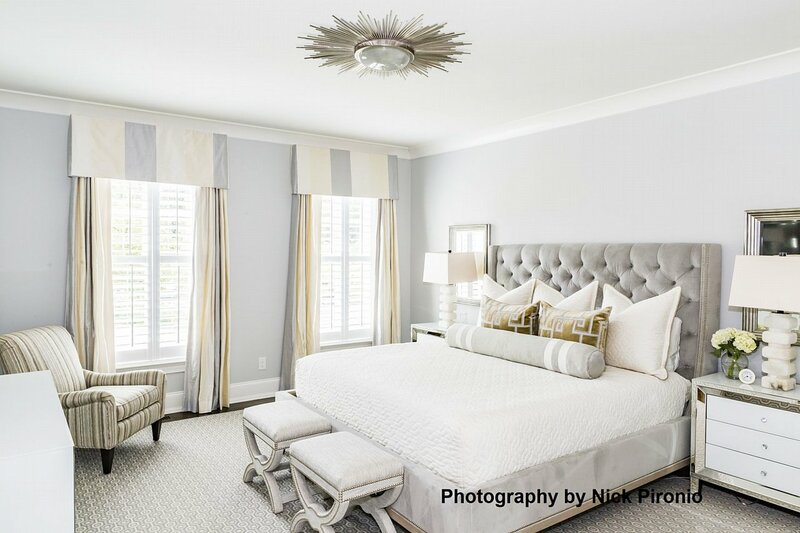 So, upon the recommendation of a mutual friend, the Westmorelands hired MA Allen at MA Allen Interiors who worked in conjunction with the Murphy Garnow Design Group and DJF Builders to give the family a home specifically designed to grow with them. 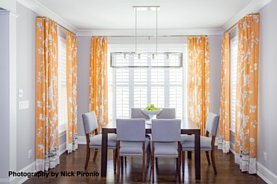 It was a tall order – one that required a complete dismantling before moving forward. The traditional ranch home was taken down to the foundation and rebuilt with strategic additions that opened up the floor plan to create a functional, modern layout, including customized details to give a personal touch to each room. 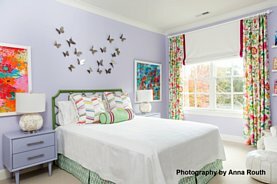 “There were multiple opportunities to make this project a success,” Allen says. 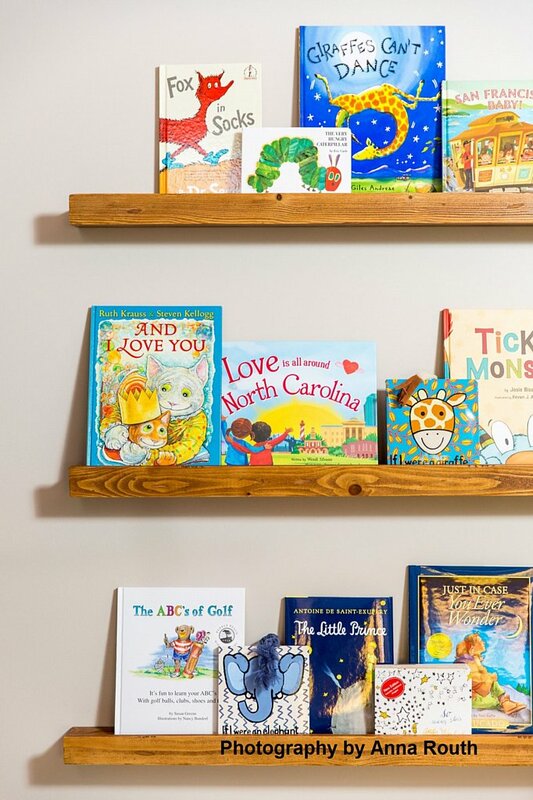 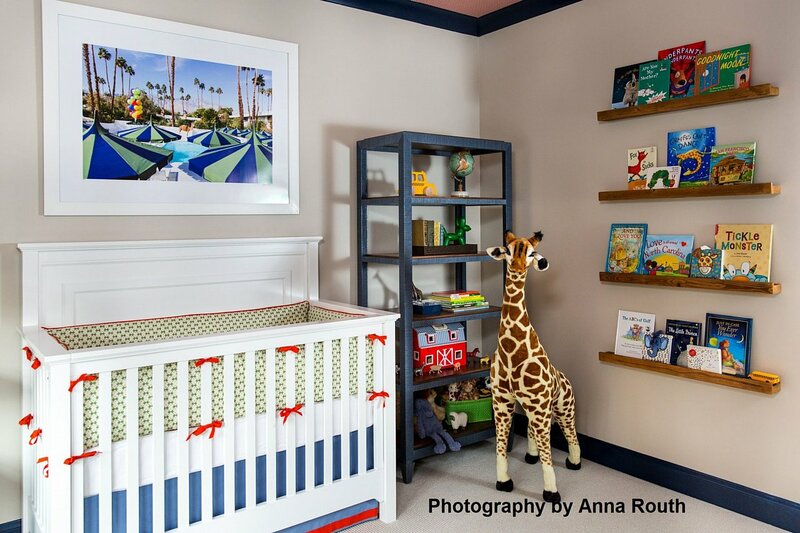 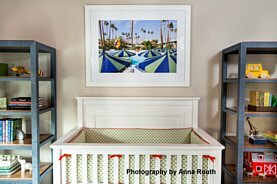 “The Westmorelands were openminded and willing to take risks, and a healthy budget gave us the ability to implement extra creative touches to truly personalize their residence.” The renovation added two guest bedrooms, a bonus room, and a nursery. 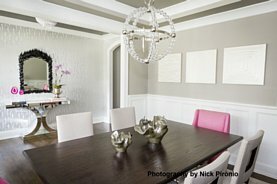 The result was a spacious home with more than 4,000 square feet of living space custom designed to provide the functionality, durability, and sleek aesthetic required of a modern family on the move. 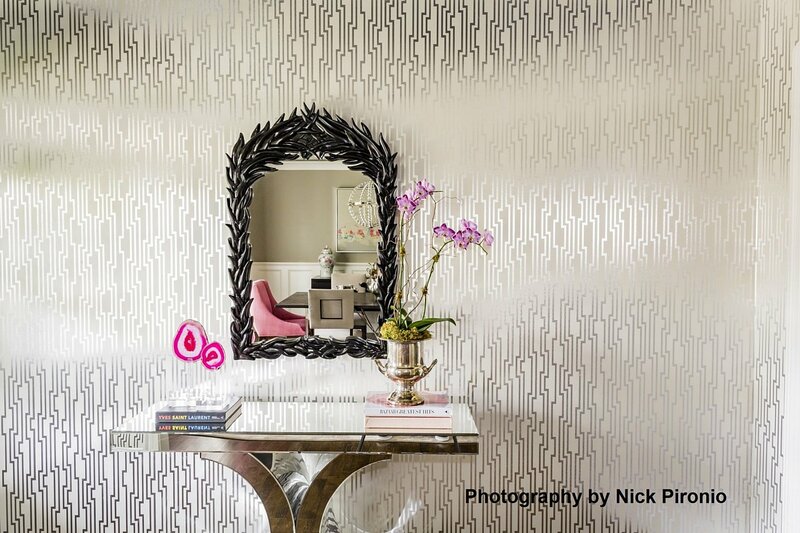 Guests are greeted inside the front door with a metallic geometric print wallpaper. 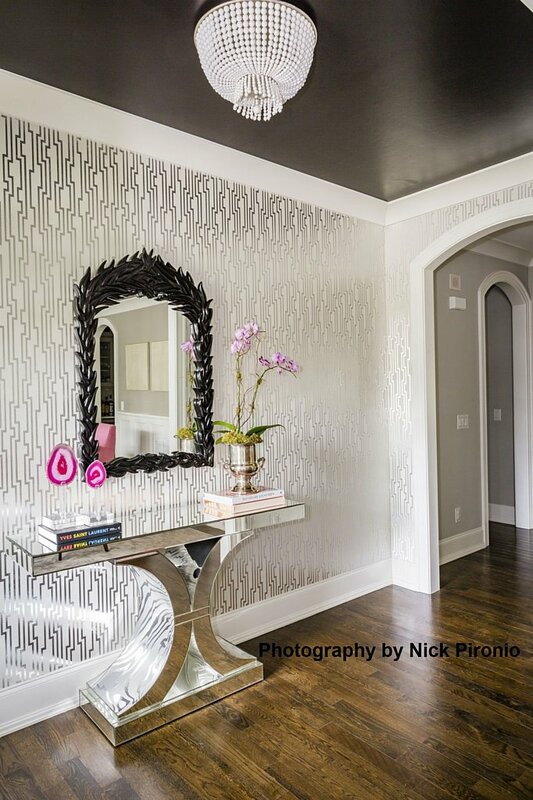 The eclectic mirror inspired the black foyer ceiling, a pairing that was originally a tough sell. It is offset by a white beaded Visual Comfort chandelier and mirrored table that up the drama and prove that bold details can make even the smallest space powerful. 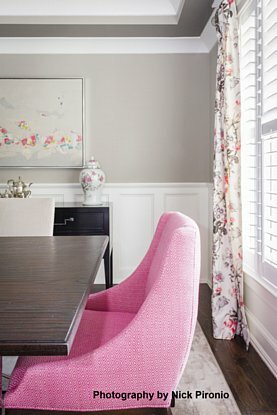 The dining room’s otherwise neutral walls and dining chairs are accented with vibrant pink sloping armchairs, floral Schumacher curtains, and custom artwork. 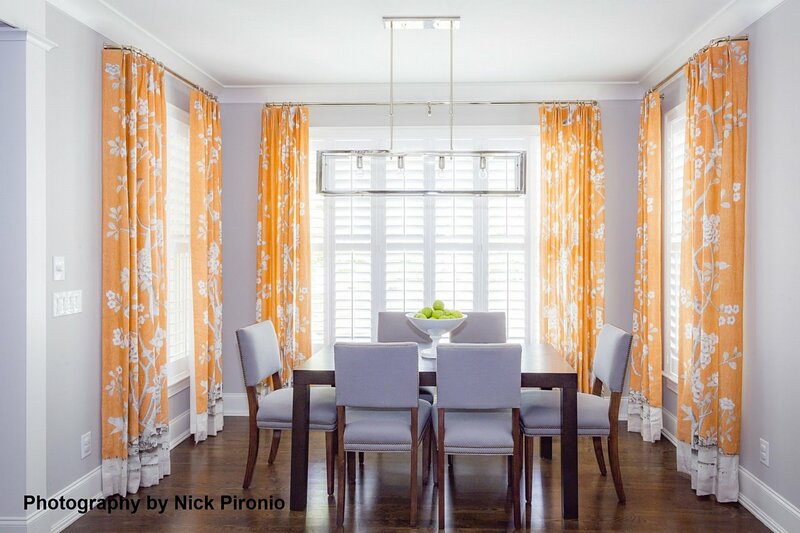 These same sharp contrasts between natural tones and bright hues are applied in the kitchen and breakfast area, where a family-friendly open floor plan creates a light, airy atmosphere that is freshened up with curtains in orange Schumacher fabric by Mary McDonald. 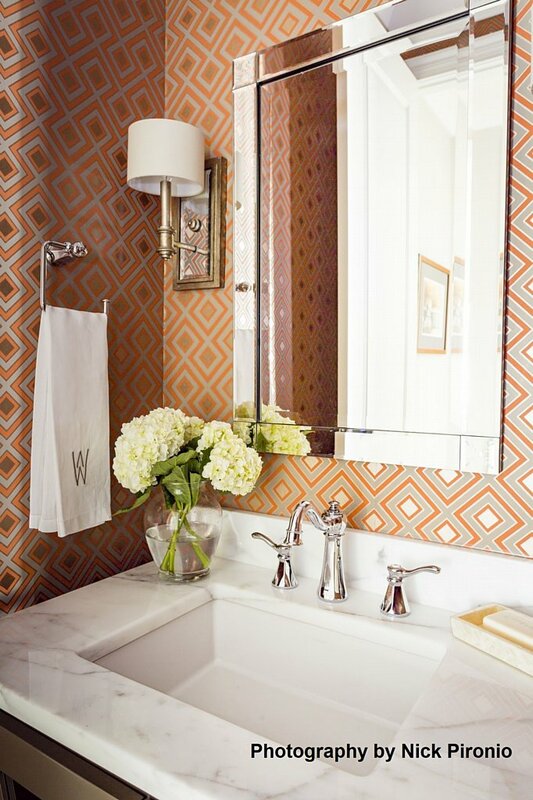 The vivid orange hue carries throughout the home, appearing in doses on accessories and linens and is beautifully showcased as the star in a bold geometricprint wallpaper in the powder room. 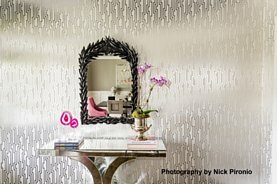 Additionally, a Calacatta gold marble vanity and custom cabinet with mirrored front take an otherwise small space from ho-hum to Hollywood glam. 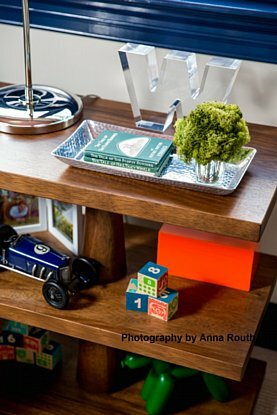 A key to Allen’s design was implementing pieces that do double duty, serving a functional purpose while also adding flair. 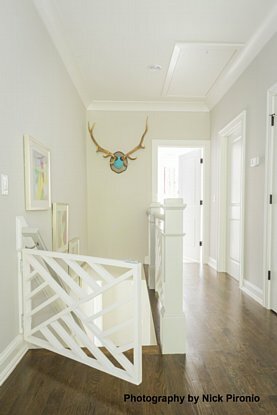 A Chippendale-style baby gate was custom-designed to coordinate with the stair railing, an element that is both functional and fashionable. 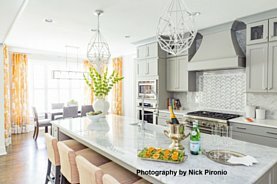 In the kitchen, the Carrara marble backsplash and island feature quartz on the perimeter for increased durability. 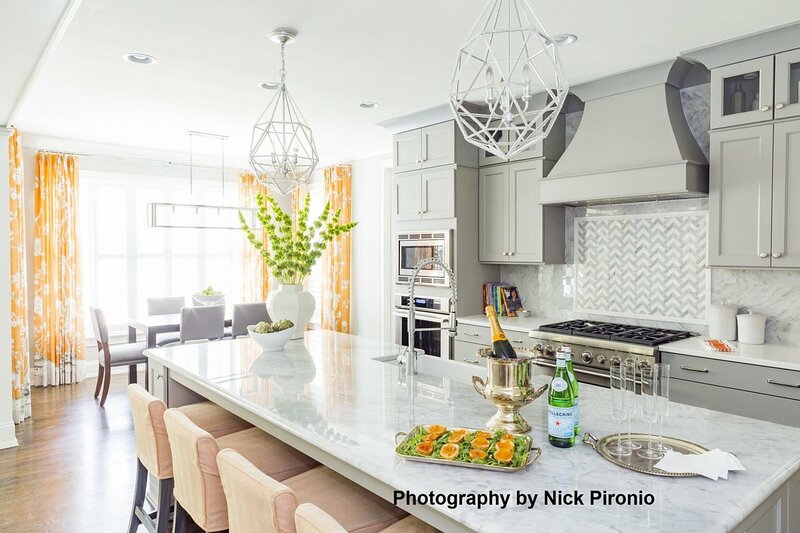 Thermador appliances and custom cabinetry offer both useful and aesthetically-pleasing storage and cooking options, while slip-covered barstools and Crypton fabric on breakfast chairs are stain-resistant and easy to maintain – a must for homes with small children. 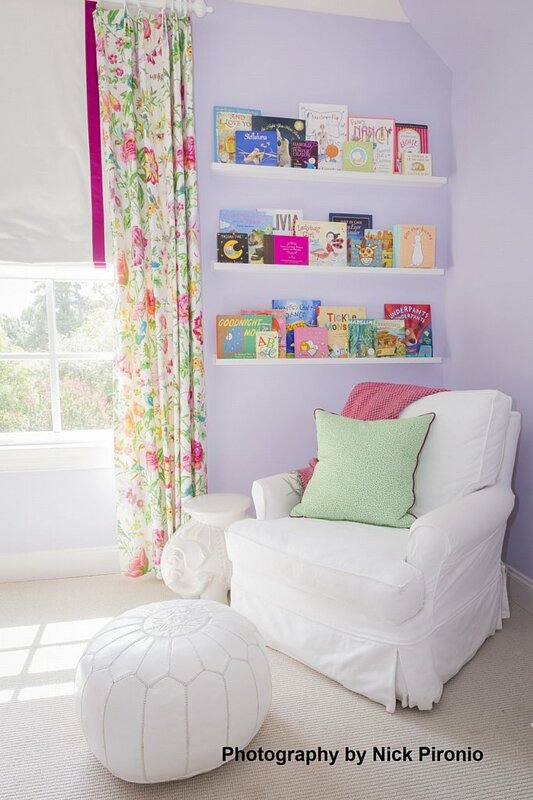 Double sofas in the family room along with coordinating armchairs maximize seating capacity. And high, arched doorways and windowed doors lend a sense of airy, openness to the space. 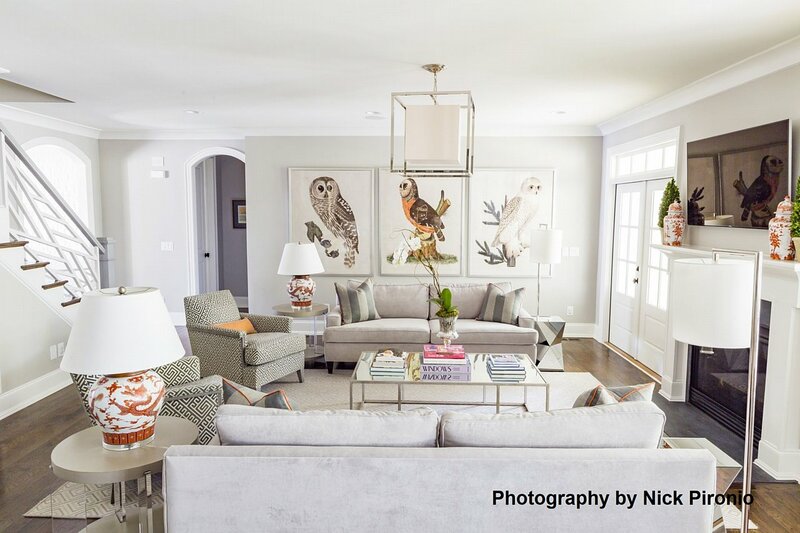 The contrast between modern and traditional are in the details – the traditional Scalamandre Maison lamps and vases juxtaposed with the contemporary geometric chair fabric, as well as in the large-scale Natural Curiosities owl prints that create a sense of traditional-design-mademodern. 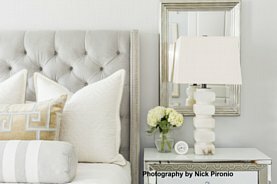 The mirror-topped cocktail table and the Lucite and wood side tables impart a bit of glam to jazz up the neutral palette. 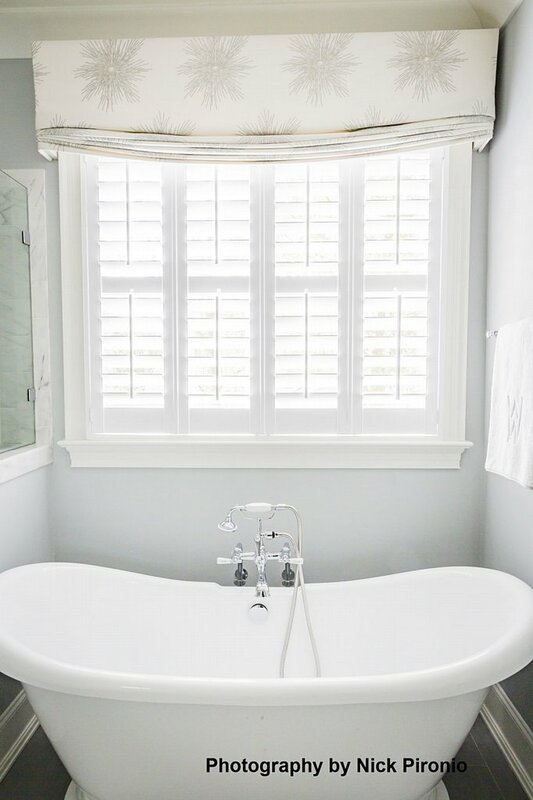 In the master suite, Allen opted for mirrored chests and accessories along with a velvet headboard and mixed textures to create a luxe retreat, which is repeated in the sleek and clean aesthetic of the adjoining spa-like bath. The master closet expertly marries fun and function. 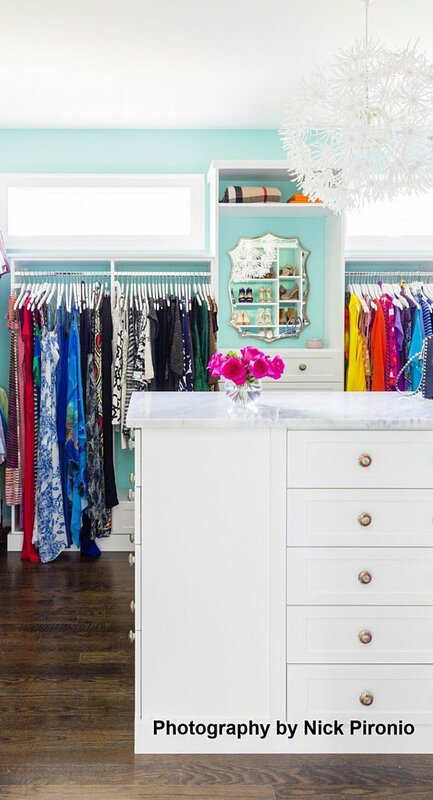 “A closet should never be overlooked,” Allen says. 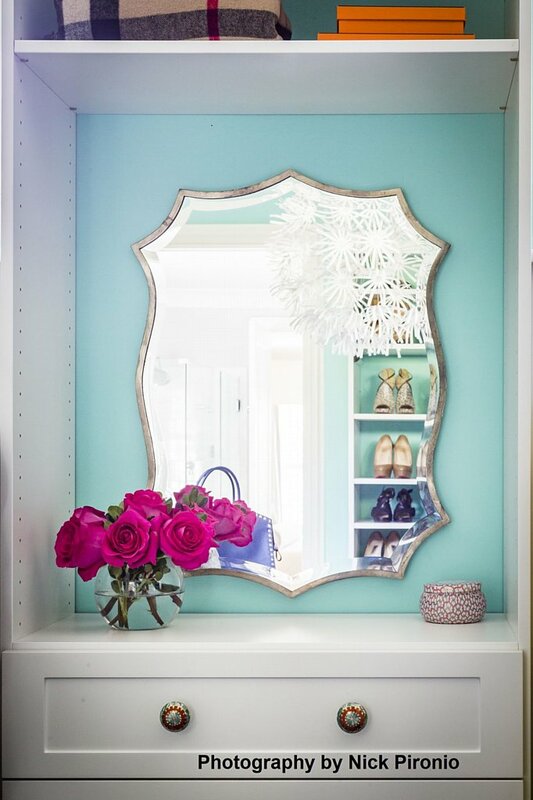 The Westmorelands’ master closet proves that closets can make a statement of their own with bright aqua walls and crisp, white cabinetry featuring colored hardware. The closet, custom designed down to the inch based on the homeowners’ inventory and love of shoes, features precise and efficient storage with pizzazz. 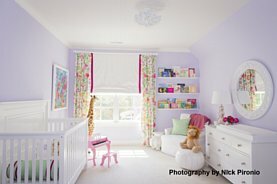 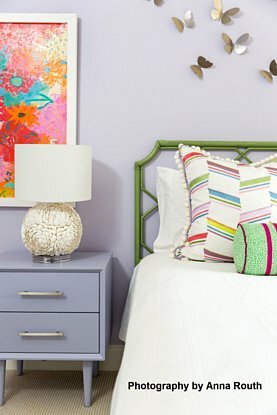 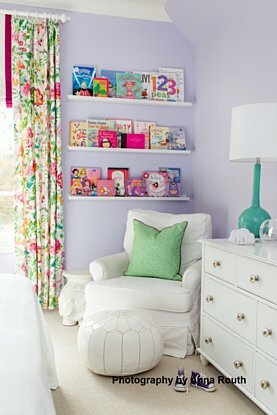 Select items from the original nursery were reincorporated in the daughter’s room along with lavender walls and bedside tables to add feminine elegance that will grow along with her. 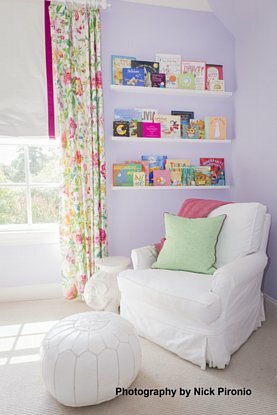 Book ledges were installed to not only allow easy access to reading material but also showcase the colorful covers as art. 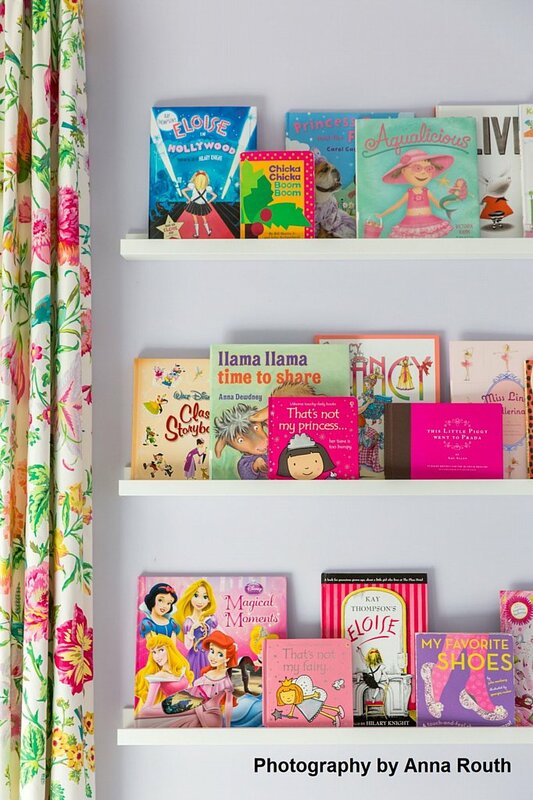 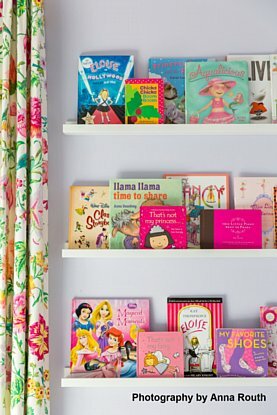 Bold, floral Schumacher curtains and fun pom-pom pillow trims from Samuel & Sons add interest and youthful energy perfectly suited for a growing girl. 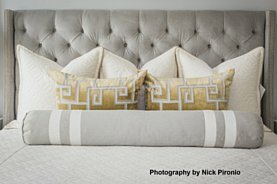 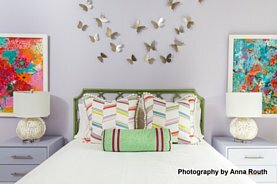 Nickel-toned butterflies, arranged in a freeform pattern, create three-dimensional movement over the headboard. 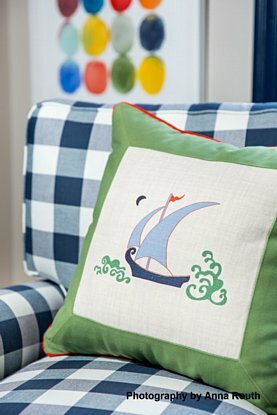 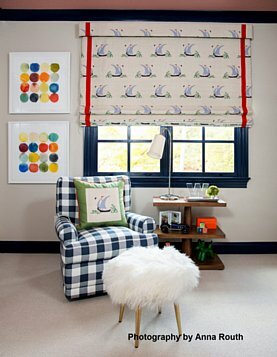 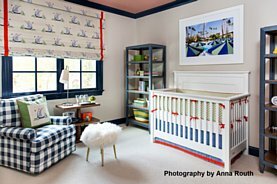 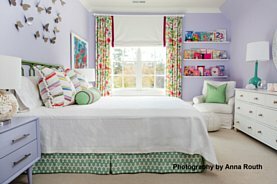 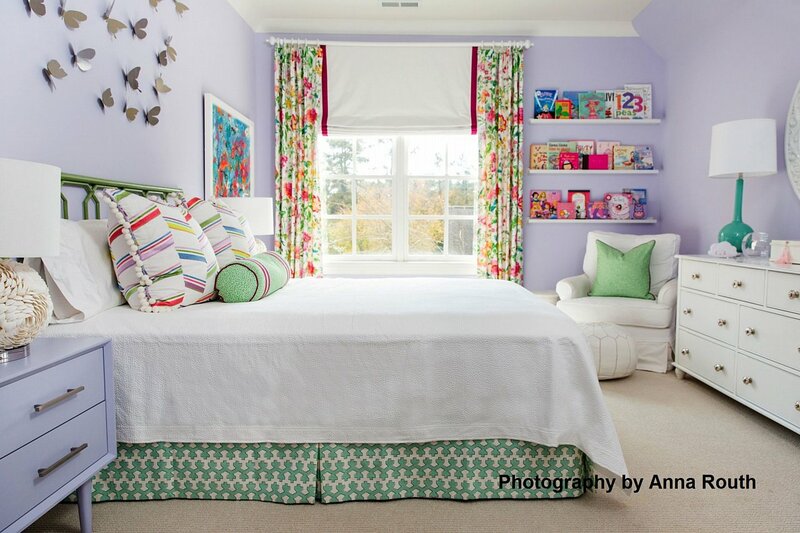 In the nursery, Allen used a favorite Katie Ridder fabric as an anchor point in the design. 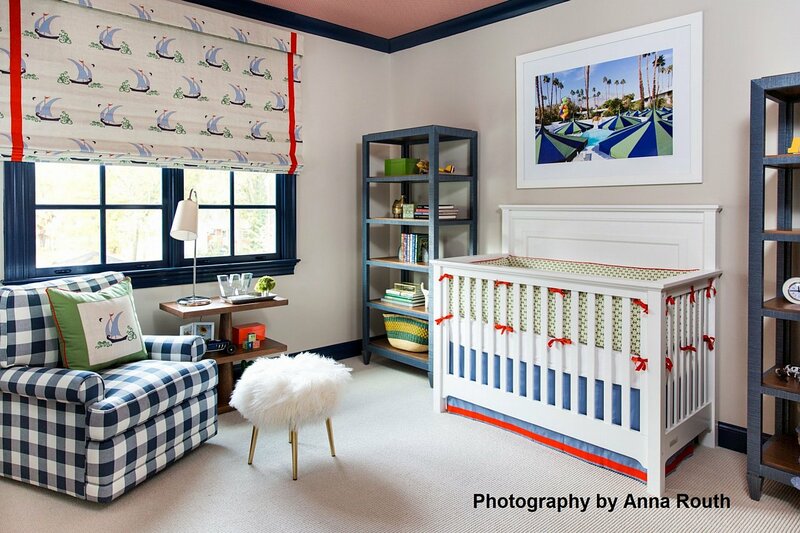 “I’d been holding onto the fabric swatch, waiting for the perfect opportunity to use it.” The sailboat print inspired the blue-and-green palette accented with pops of red-orange, and an orange Schumacher wallpaper provides an unconventional choice for ceiling cover. 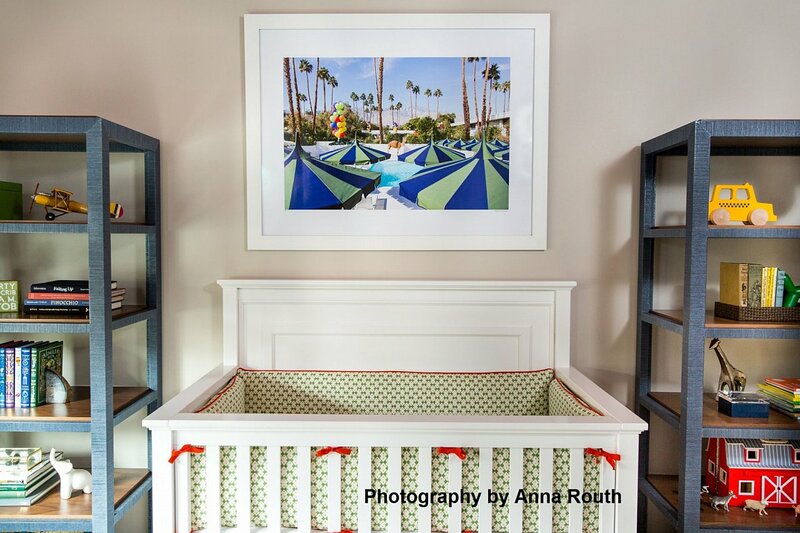 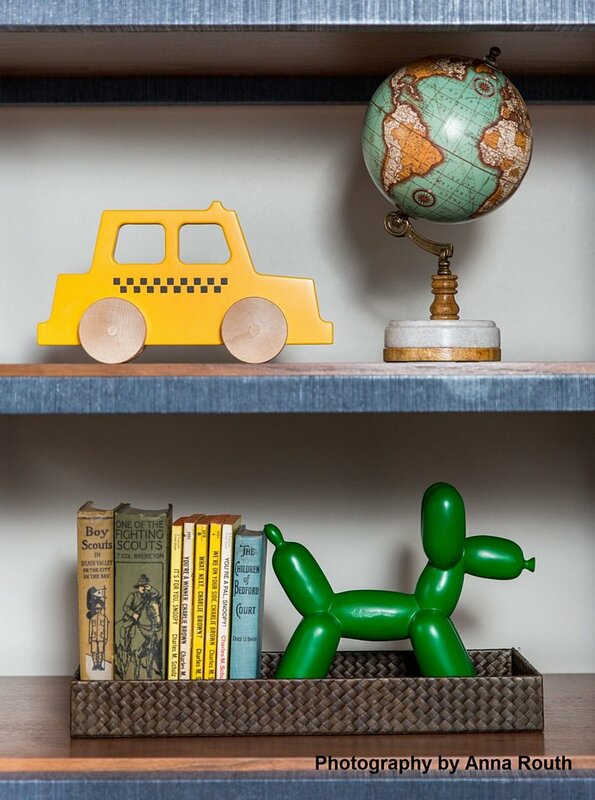 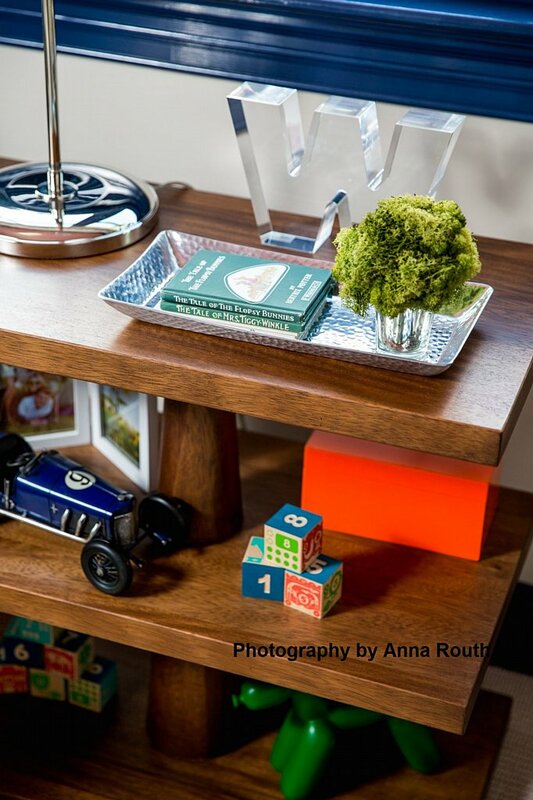 An eclectic mix of accessories and vintage books line the bookshelves, and a fine art photographic print by Gray Malin above the crib lends a spirit of fun. 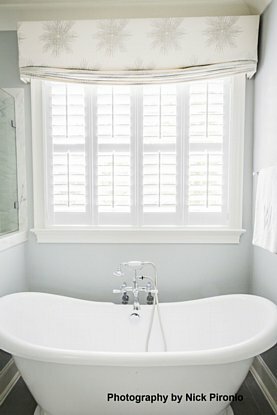 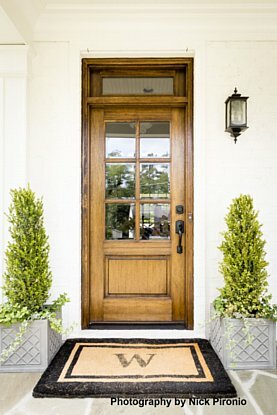 It’s this same attention to detail that distinguishes the Westmorelands’ home design from the crowd. 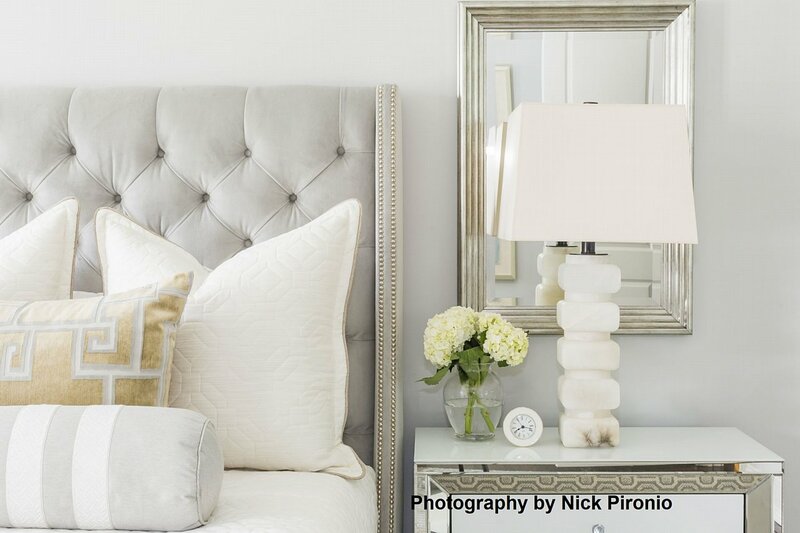 Lively pops of color and chic elements of luxe and glam mingle comfortably with the neutral palette that pulls it all together. 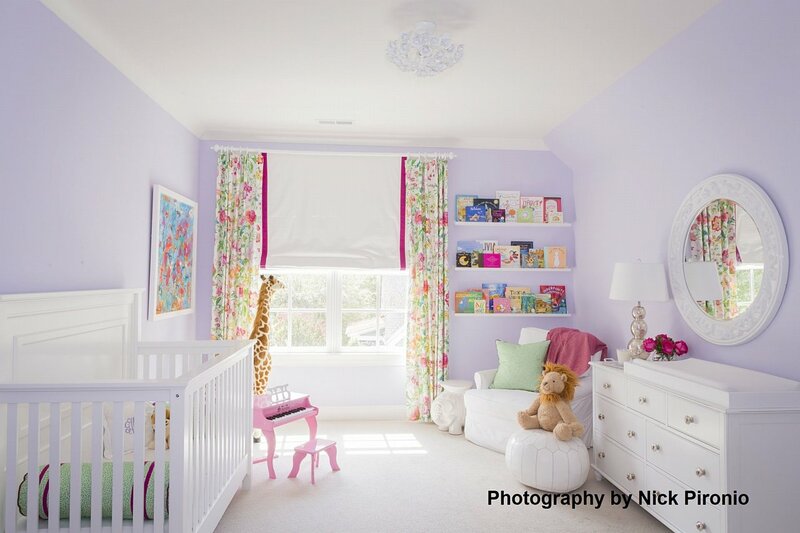 Now, the homeowners have the perfect modern space to accommodate their growing family.